Fourwinds B&B has rooms that offer versatile accommodation, either in twin, double or as family room formats. There is also a cosy welcoming conservatory available for our guests to use to enjoy the sunshine or a change of scenery. For the all important breakfast, we serve locally sourced free range meat products and eggs, juices, home made breads and ground coffee. Guest conservatory and 5 acres of land to enjoy. Self catering options also available, call us for more info on 01354 658737. Located upstairs and benefiting from an ensuite shower room. This spacious and light room can accommodate a family of 4 comfortably with a double and 2 full sized single beds. The view from this room is wonderful – especially when the sun is rising. Check in from 3.30pm and check out at 11am. 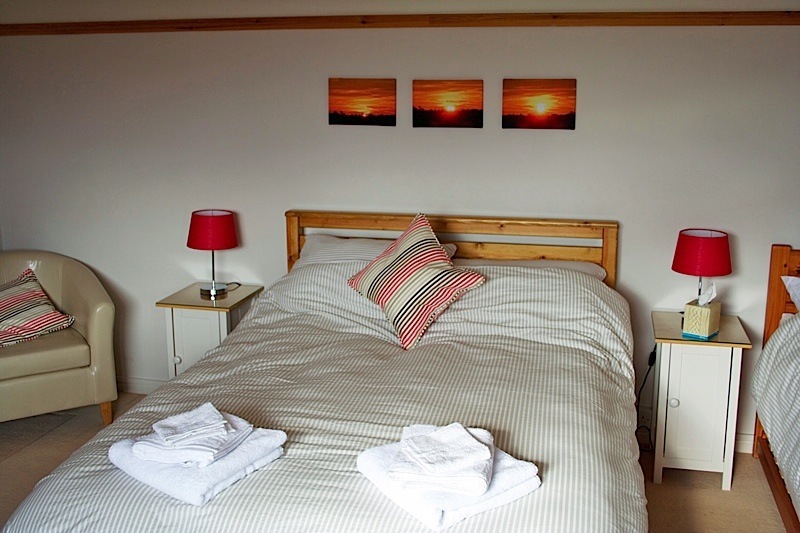 Sorry no pets except in our self catering log cabin – ask for details.